Thursday, June 14th, 2012 marks the return of the show control case study session! At this free and open session, we will have presentations on three interesting show control systems: a museum in the Netherlands, a themed retail installation in the northeast, and an academic themed attraction in NYC. 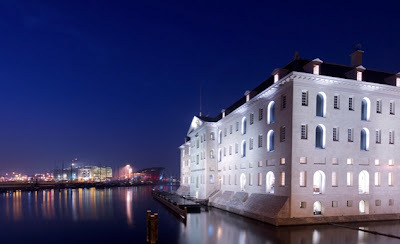 The Amsterdam Maritime Museum consists of themed exhibitions and interactive exhibits. Rapenburg Plaza was responsible for the complete media and lighting control, the major part of the audio-visual installations and also the entire technical content, including the lighting design for the Voyage at Sea – an impressive maritime experience. The system was built using Medialon software, KissBox interfaces and industrial network hardware and software. The system allows the personnel complete control over all lighting and AV equipment, however Rapenburg Plaza programmers can also manage and monitor the entire installation remotely. Jordan's Furniture commissioned a show to run daily in their Warwick, Rhode Island location. It features fountains, surround sound, lighting and lasers, all controlled using Zanim8tion and AV Stumpfl hardware and software. The Gravesend Inn is a high-tech, interactive, audience-driven haunted hotel attraction, which has been staged in Brooklyn by New York City College of Technology’s Entertainment Technology department for more than 10 years, with a typical attendance of about 2000 people. In 2011, for the first time, all the control, video playback, video surveillance, and audio distribution was run over a distributed, managed Ethernet network with multiple VLAN's and inter-VLAN routing. Medialon Manager is the show control system and communicates to all but one device in the entire attraction over IP and Ethernet. Open time--anyone can present on any show control-related topic for 5-10 minutes. First come, first served. Thanks to the generosity of Kevin Ruud, we will be meeting in the Kelley Technologies Boardroom, which is located at 5625 Arville Street, Suite E, Las Vegas, NV 89118-2280 (google map here). We will likely chip in and order in some food. I'll post any updates on the day of the event on twitter. OK, here's the rest of the details. 8:30pm: Indoor, electric go karts at Pole Position Indoor Karting Raceway. If you know you're going to do the go-karts, let me know and I can try to get a group discount. I will post updates that night on my twitter feed. All are welcome, see you in Vegas!! !